No matter what you call it, muddy buddies or puppy chow, this sweet treat is absolutely delicious. 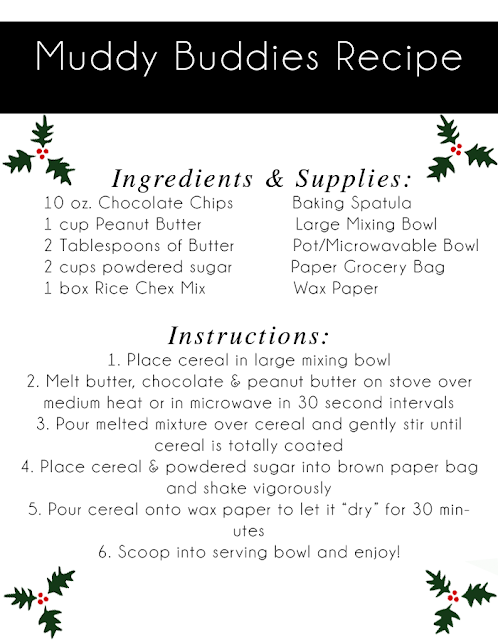 I first learned the recipe in high school and have been making it for my family every holiday season since. It's one of my favorite easy recipes because from start to finish, it takes about 10 minutes and there is literally no prep work, unless you count shopping for the ingredients! It's also great to take to parties or give as little sweet treats to co-workers because it's bite sized and doesn't have to be eaten all at once! 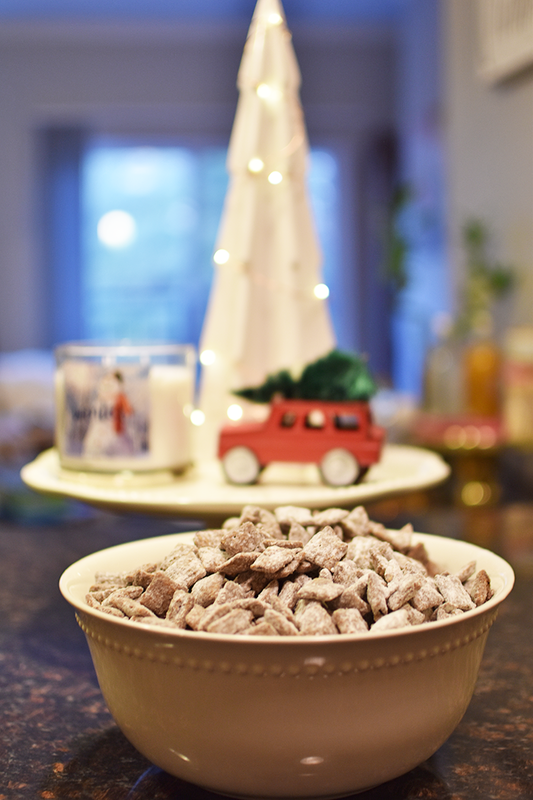 Before you start, make sure you have enough space cleared on your counter or table to lay out your muddy buddies so they can dry properly. When you're ready to melt the butter, peanut butter and chocolate together, you can do so either in the microwave or on your stove top. If your burners are a little unpredictable with how hot they get, it might be better to melt in the microwave. I can't tell you how many times I've ended up with a huge lump of chocolatey peanut butter when I was using an unfamiliar stove top - still yummy, but definitely not what you're looking for in this recipe. If you're going the stove top method, I can't stress enough that you should be stirring constantly to avoid the mixture burning on the bottom. If you're going to use the microwave, use 30 second intervals and stir in-between each one. One last tip is to be very gentle when stirring the chocolate and cereal mixture. You want to try to keep the cereal as intact as possible! Most of the time serving this usually means trying to at least get it into a bowl before someone sneaks a bit, and when I'm gifting it, I usually pre-package it into those cute treat bags you can find at the grocery store. I also think it would be adorable to serve this in cute cupcake liners if you've got a color theme going for your party!